The primary cause of skin cancer is ultra violet radiation-most often from the sun, but also from artificial sources like sunlamps and tanning booths. Anyone can get skin cancer regardless of your skin type, race, or age. People with a history of exposure to the sun and elements have a significant increase in the risk and incidence of skin cancer. All lesions that show a change in their nature, particularly bleeding, color changes, or growth, warrant expeditious examination by a physician. Spotting changes in current moles and/or developing lesions early on can help prevent the development and spread of skin cancer. 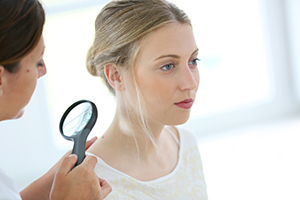 It is important to know what to look for and how to look for it when dealing with early skin cancer detection. Watch for the “ABCDE” warning signs of melanoma: Asymmetry-a growth with unmatched halves; Border irregularity-ragged or blurred edges; Color-a mottled appearance, with shades of tan, brown, and black, sometimes mixed with red, white, or blue; Diameter-a growth more than 6 mm across (about the size of a pencil eraser); and Evolving-changing in size, shape, or shade of color. Dr. Joseph DiBello strongly urges all patients to have regular check-ups with a qualified dermatologist to check for suspicious lesions. Both dermatologists and plastic surgeons are skilled at diagnosing and treating skin cancer and other skin growths. A plastic surgeon can surgically remove the growth in a manner that maintains function and offers the most pleasing final appearance-a consideration that may be especially important if the mole or cancer is in a highly visible area. If a treatment other than surgical excision is called for, Dr. DiBello can refer you to the appropriate specialist. Skin cancers, when they occur, often require excision. Dermatologists will occasionally utilize Mohs micrographic surgery to remove certain lesions, and sometimes will ask Dr. DiBello to help with closure of the resulting wound. Alternatively, some physicians prefer to refer the excision, as well as the closure, to Dr. DiBello. Abnormally pigmented skin lesions (moles), skin lesions that are symptomatic, or skin lesions which have failed nonsurgical treatment are often referred to Dr. DiBello for removal by dermatologists, family doctors, or pediatricians. In any case, Dr. DiBello is always pleased to help patients resolve these increasingly common skin problems, most of which can be taken care of in the state-of-the-art office surgical suite at DiBello Plastic Surgery.